Most flight attendants are subjected to sexual harassment by passengers, according to a survey by the Association of Flight Attendants. The survey, the first of its kind from the flight attendants' union, reported that 68% of flight attendants experience sexual harassment during their flying careers. More than a third of survey respondents said they experienced verbal sexual harassment from passengers within the last year. Of that group, 68% said they experienced it three or more times, while one-third said it happened five or more times. 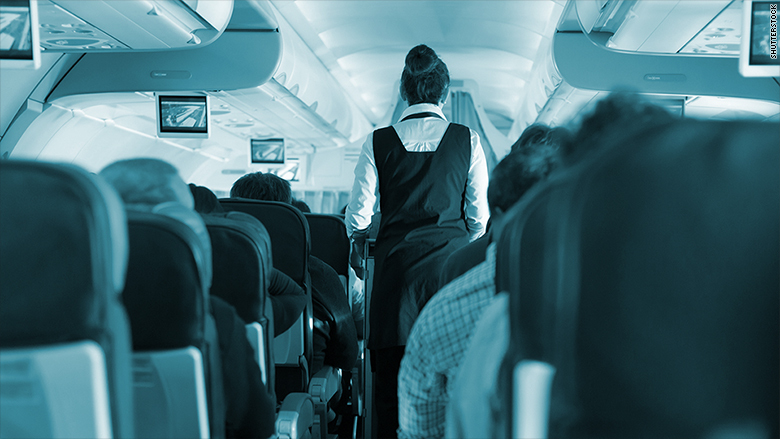 "This is a silent epidemic in our country," AFA president Sara Nelson, who's been a flight attendant for 23 years, told CNNMoney. "This is an industry that is steeped in a sexist past. The airlines for a very long time sold tickets based on defining air travel in a sexual way and oftentimes flight attendants were the object of that." Flight attendants described the verbal harassment as "nasty," "dirty" and "unwanted." They said passengers would proposition them, tell their sexual fantasies, and request pornographic videos and pictures. The survey says this harassment occurred "despite the prevalence of abuse and the emergence of the #MeToo movement" which seeks to bring an end to sexual harassment and assault. "I used to get cornered in the back galley and asked what my hottest layover was," said Nelson. "When I started flying I used to get asked if I was a member of the mile high club. That was a common quip from a passenger." Eighteen percent of the survey respondents said they experienced physical sexual harassment within the last year, and of that group, 40% said it happened three or more times. They described being "groped," "grabbed" and "slapped," above and below their uniforms. Some of them said they were followed, cornered or lunged at, and hugged, kissed or "humped." Nelson said that harassment also interferes with the attendants' role as first responders since "we can't do that as victims ourselves." Only 7% of survey respondents said they actually reported the abuse to their employer, and 68% said their employers haven't done anything to address the abuse. The AFA credited Alaska Airlines (ALK), Spirit Airlines (SAVE), and United Airlines (UAL) as having "led the industry in addressing this issue." Nelson, who is employed by United, said the CEOs for the three airlines wrote open letters denouncing sexual harassment and announcing zero tolerance policies. In a statement, Alaska Airlines said "We appreciate the partnership with the AFA, law enforcement and experts to do our part in addressing this pervasive societal issue." Spirit and United did not immediately respond to messages from CNNMoney. The survey results are based on responses from 3,500 flight attendants from 29 US airlines. They survey was conducted in February and March of this year and 80% of the respondents were women, and 20% were men. Harassment isn't just a problem faced by women, said Nelson. "I've seen incredible harassment towards my male flying partners," she said. This is the first time the AFA has done a survey like this, according to the group's spokeswoman. Last year, the AFA did a survey about passenger-on-passenger assault. The Center for American Progress conducted a study last year about sexual harassment in the work place. The study, which looked at sexual harassment charges in a 10-year span ending in 2015, found that one-quarter of charges were filed in the service industries "including many low-wage jobs that are often occupied by women."